Ted Dewart, Ph.D. & Dr. Michael Frost, M.D. "Local Experts Solve Adolescent & Young Adult Problems"
But, their work doesn't stop there. When the problem extends to suspected alcohol abuse, street drugs, or abuse of prescription medications, these two pros can be your own, and your adolescent's best friend. If needed, their treatment plan can often provide detoxification and treatment for withdrawal without having to miss a single day of school or work! And, when indicated, patients are given medications afterwards to help them not use again. When combined with their individualized intensive psychotherapy sessions, their success rate for total abstinence after one year with those who stay with the plan is phenomenal. Their treatment is entirely office-based, individualized, and designed so as to minimize interruption of school attendance or work. "We're attempting to challenge outdated beliefs that adolescents are impossible to reach while, at the same time, clearly demonstrating that contemporary 45 minute counseling sessions are totally inadequate to get to the source of an adolescent's belief system," says Michael Frost, M.D., a Board Certified physician in Addiction Medicine. "With our current knowledge of brain chemistry, we know that we're working with many whose brain development cannot yet provide the ability to say 'No' to impulses." 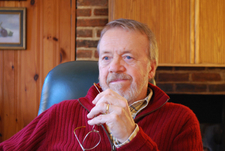 Working with him is William 'Ted' Dewart, Ph.D., a well known clinician in Clinical Psychology with over 35 years' experience working with adult and adolescent populations. "I think the reason our team approach has been so successful is that we have been able to gain their trust by approaching each adolescent as grown up, but needing a lot more really good information. The majority of our patients - whether young or older - love the fact that we teach them how to be very successful in life but how their thinking and behavior is getting in the way." Dewart, who, for the past 25 years has also been a successful corporate consultant with senior level management uses many of the same principles he teaches CEOs, and takes the time to do it right. "Rather than trying to be a 'shrink,' who most adolescents hate, I teach them how their current ways of thinking and relating don't work, and why. Almost all have been to numerous counselors and therapists and feel totally 'burnt out' with traditional psychotherapy. Beneath most angry adolescents I almost always see a kid who is frightened of growing up and needs a really good 'Uncle' figure who - without judgment - can show them how to get ahead in life. And, when we have a patient who has accidentally become addicted to prescription pain medication, Dr. Frost is right there to see them immediately." Dr. 'Mike' Frost, who is board certified in Addiction Medicine and Internal Medicine, is an internationally renowned speaker and one of this area's leading pioneers in successful outpatient detoxification and treatment for withdrawal. "I think what we do as a team is, frankly, unlike anything else out there. It is - at the same time -a relaxed treatment plan for adolescents, and one driven by the most recent advances in Adolescent Psychiatry and Addiction Medicine. We have many adolescents who simply need Ted's work, and it's amazing to watch how quickly they go from being near-delinquent to pretty upstanding, young adults." Dewart seems equally as impressed with Frost's work, "I can't tell you how astounding it is to see a highly addicted adolescent see Mike for an hour and, after taking their first dose of new medication, they are able to walk out totally free from the cravings and cycle of addiction. They don't need a rehab center when they're seeing the two of us. They can return to school or work the following day. Mike is truly a professional when it comes to these kinds of conditions." Dewart and Frost are very open about their concern for the amount of prescription medications that are so much a part of today's adolescents' lives. "I think parents are not fully aware of how easy it is to for these kids to get hooked on these medications. They are everywhere. They're being handed out in school, in malls, at parties... it's quite insidious, and very dangerous," says Dewart who, himself, was Co-Director of a heroin drug clinic in Massachusetts in the late 1960's. "Back then, heroin suddenly came into the North Shore of Boston, a very upper class area. School kids were dropping in like flies, begging for help. Today, here on the Main Line, it feels like I'm being thrown back in time. Again, here are these kids from very good homes in our area coming in with extraordinary levels of addiction to pain killers and heroin, and their parents have not picked it up. I just finished reading an article on the front page of this week's New York Times Sunday Edition about the problem they're having with heroin in the Hamptons." "The major difference is that back then we had only Methadone available," says Dewart. "Today, Dr. Frost's expertise with these newer medicines mean an adolescent can walk in terribly sick from withdrawal, and walk out totally fine." With our plan many are able to leave his office and then come to visit with me. They begin their total recovery that very same day." Dewart continued, "Mike draws from a whole new category of new medications that help to stabilize the brain chemistry of those adolescents who have become accidentally addicted. When that's corrected, their symptoms of addiction dissolve entirely. It's quite extraordinary how he is able to provide a platform of stability and structure on which I can then begin to address their maladaptive ways of thinking and behaving. Because he's Board Certified in Addiction Medicine, he really knows the best medications to use and, almost more important, which ones not to prescribe for people using drugs. Also, what I particularly like is that Mike shares my belief that the typical physician or psychiatric 15 minute-session just isn't good enough. He spends a good deal of time with his patients, in most cases up to an hour for each meeting and helps to answer all questions. He routinely gives them urine tests to make sure they are staying on top of their own treatment, and offers a lot of good advice. And they really do like him, which is pretty unusual with adolescents." You'd think that these two experts would be jaded and fatigued by the intensity of their work and their years of experience. Yet the passion these two bring to their work with adolescents is unmistakable. "The work that Ted and I are doing is extremely 'cutting edge' and, frankly, enjoyable. Ted brings a lot of energy, humor, and fun to the table, especially with the adolescents he's seeing. Unlike other counselors I've worked with in the past, Ted spends two hours per session, and I can tell you that is simply unheard of in the field of mental health." Dewart's thoughts on this? "Well, I don't know how any patient, no matter how young or old, can be with a therapist for only 45 minutes a week and have that be enough to bring about significant change, let alone lasting change. I think that much of the success comes out of that second hour. Adolescents, in particular, are naturally prone not to talk much, or they've learned through media what it is that 'the shrink' wants to hear and then wait for that lethargic, 'Well, I see our time is up.' That doesn't fly here at all. From day one, these adolescents know that they have to be on their toes and they have to contribute. I help them figure out what's going on by putting it up on the whiteboard. I walk around while I talk. If they get sleepy, I'll get them a Coke & talk about their favorite Indie band, or I'll switch seats with them. Other times I'll take a picture of their own whiteboard material of insights and send it to them via my Smartphone. The point is that it's entirely collaborative and I expect input. At other times I teach them things about themselves that they've never heard of. After testing, I review and explain their test results, including their diagnoses, right up front. For many of these adolescents, they've been in and out of all sorts of therapists' offices but have never even been told what their diagnosis was! In a lot of ways," laughs Dewart, "I'm teaching them material that I used to teach psychiatric residents. So, they keep getting excellent information about themselves, their level of adjustment, about life, about business, alternated with humor and short breaks. It is gratifying to watch them walk out at the end of a 2-hour session feeling tired, yes, but more confident from what they learned that day." Dr. Frost points out, " I think Ted would agree that having our weekly Team Meetings gives each adolescent's progress not only careful scrutiny, but it gives the two of us professionals - who would normally work in a vacuum - a much greater perspective on our kids' lives. I can't tell you how many times we've run into a case where a primary care physician or psychiatrist was, on the one hand prescribing something for, say, withdrawal from Oxycontin while at the same time writing prescriptions for tranquilizers! They don't realize that they're dealing with addiction as a disease. Tranquilizers, by themselves, feed the same pathways to the brain as narcotics and are certainly abused and/or sold by many kids to supplement their Oxycontin addiction." Dr. Frost continued, "We perform much like a good Mom and Dad who are very much together in our decisions of what is right and what is wrong. There's no chance of splitting the two of us, which is a very common behavior with this age group. Here it's all about truth, health, and integrity." Well, what Dewart and Frost are doing is obviously working. With problems associated with ordinary adolescent and young adulthood such as oppositional behavior, lying, or even extreme anxiety, 'Ted 'Dewart Ph.D. is an obvious choice. But, for those occasions where drug use is also suspected and/or medications are warranted, having Mike Frost M.D. on board makes them a powerful team devoted to helping adolescents start thinking and behaving correctly. You can tell that, independently, these two are more than competent; they're experts. But, when you combine them with their team approach, it's no wonder why there is so much 'buzz' going on about what they are accomplishing."